"This small black person represents us before we learned all the information about it and the big gold person is how he feels after we've been enriched with all the knowledge." I haven't been able to find a full story about the event depicted in the video below, but it appears to be a presentation to the Martinsville City council by a group of students from the Piedmont Governor's School about a recent survey they conducted with local residents. They created some type of "story quilt" to represent their learning. As the students presented, Sharon Hodge, the only black member of the City Council, stopped them after the comment above. After asking for clarification, she expressed her feelings of offense at the portrayal. We're just a few weeks removed from the all the news surrounding Brad Paisley's collaboration on "Accidental Racist" with LL Cool J. Critics especially cut the opening lines of the song in which Paisley tries to justify his "confederate flag" shirt by claiming he only wears it because he's a fan of Lynard Skynard. Likewise, I doubt the students creating the quilt intended to offend anyone by using a small black figure to represent ignorance. Does that excuse the action? The council lady goes on to defend her actions in an interview with a local news station. She points out in the video the lack of diversity in the group- all white with all white teachers. She also mentions that only ten percent of people interviewed by the students were black in a city where the population is over forty percent black. She clearly states that intent is not the issue. And it isn't when it comes to racially sensitive issues. Whether I mean to offend or not doesn't change the offense. In a diverse public education system this is an ever present problem. In the comment section to the video above, at the time of this post, only one comment supported the councilor. User name- mhairston. Anyone familiar with the Martinsville area would recognize the last name and why it is significant that it is the only supportive voice. The area has a deep history with race. Growing up white in Martinsville, I was largely unaffected by issues of race. The older I get, the more I realize how much I missed out on the meaning of race because of my skin color. I imagine the lives of black, white, Asian, Latino, etc., are all affected by race in ways that different ethnic groups are not aware of, making the risks of "accidental racism" all the more likely. As teachers, we respect and love all of our students. We carry our own "ethnic baggage" complete with preferences and prejudices just like anyone else. But, we serve a population of students bringing all their "baggage" on the trip as well. I'm sure that somewhere along the line I've crossed the line unintentionally, but I hope that I've been able to build strong enough relationships to grow in my understanding and respect of those who are different from me. In the end, we're all the same underneath the skin. But human interactions are skin to skin and race isn't something that can just be ignored. I think for a white person, without understanding the history of race in the area AND without understanding the current racial experience of others it would be easy to shout this council lady down for calling out an innocent student. But, I can understand why she might find "a little black guy representing ignorance" offensive. "We want a window." I fondly remember this clip from one of my favorite movies, The Right Stuff, from way back in 1983. The scientists and astronauts have the same goal in mind here but the difference in perspective and understanding becomes obvious in how they approach the design of the capsule/spacecraft. That same year, 1983 saw the release of A Nation at Risk. A catalyst for waves of change even more frantic than the space race. The subsequent changes in our nations schools are revolutionary indeed. Another connection to the film is that this same divide exists in education. As we move into new frontiers in learning and teaching many decision makers seek to remake the educational process. What they seek and desire for the future can differ greatly from those working in the classrooms and with students themselves. The everyday teacher's version of the future seems far removed from this one without windows. Both groups seek to innovate and integrate technology in new and helpful ways. But the process of change reveals what amounts to a philosophical gulf. We want the same things in general as a goal but might view the end product in dramatically different ways. Are there lessons in past of America's Space program as we search to implement the right stuff? The solution I see is that either teachers act more directly as leaders or a great deal must be done to integrate them into the process and provide them input. Otherwise we will roll out a capsule no one wants to fly, or even ride in. We've Lost Gerald. I don't know if he could teach but I suspect he was great. We've countless others like him. I know many in my own building who have left. That is the crisis occurring in education across the nation. Despite what you read and hear much of the rest of what is going on in education is a conceived crisis for the sake of creating movement. Sure we need to do better and improve but the result is we are losing talent and caring individuals at an alarming rate. Those pedaling snake oil have found plenty of buyers in decision makers for their products and the loss of faith in the classroom teacher results in the loss of people like Gerald. This is all reference to a retirement farewell written by a Syracuse, N.Y., social studies teacher. It was sent to me this week and has gotten a lot of attention among fellow teachers. The letter was sent to the Board of Education by Jerry Conti. I assume it is running the blog circuit and Facebook as well. I have "quit" Facebook so I am only guessing it is circulating there. I think Mr. Conti says more than I could but I also think, no wish, that someone, somewhere, in a position to make a difference would recognize this for what it is and do something. Instead of listening to pundits, outsiders and profiteers people would listen to teachers. For sure our failure to do this mean this country has a lot fewer people willing to take it at the end of each year. It is with the deepest regret that I must retire at the close of this school year, ending my more than 27 years of service at Westhill on June 30, under the provisions of the 2012-15 contract. I assume that I will be eligible for any local or state incentives that may be offered prior to my date of actual retirement and I trust that I may return to the high school at some point as a substitute teacher. STEM rules the day and “data driven” education seeks only conformity, standardization, testing and a zombie-like adherence to the shallow and generic Common Core, along with a lockstep of oversimplified so-called Essential Learnings. Creativity, academic freedom, teacher autonomy, experimentation and innovation are being stifled in a misguided effort to fix what is not broken in our system of public education and particularly not at Westhill. A long train of failures has brought us to this unfortunate pass. In their pursuit of federal tax dollars, our legislators have failed us by selling children out to private industries such as Pearson Education. The New York State United Teachers union has let down its membership by failing to mount a much more effective and vigorous campaign against this same costly and dangerous debacle. Finally, it is with sad reluctance that I say our own administration has been both uncommunicative and unresponsive to the concerns and needs of our staff and students by establishing testing and evaluation systems that are Byzantine at best and at worst, draconian. This situation has been exacerbated by other actions of the administration, in either refusing to call open forum meetings to discuss these pressing issues, or by so constraining the time limits of such meetings that little more than a conveying of information could take place. This lack of leadership at every level has only served to produce confusion, a loss of confidence and a dramatic and rapid decaying of morale. The repercussions of these ill-conceived policies will be telling and shall resound to the detriment of education for years to come. The analogy that this process is like building the airplane while we are flying would strike terror in the heart of anyone should it be applied to an actual airplane flight, a medical procedure, or even a home repair. Why should it be acceptable in our careers and in the education of our children? My profession is being demeaned by a pervasive atmosphere of distrust, dictating that teachers cannot be permitted to develop and administer their own quizzes and tests (now titled as generic “assessments”) or grade their own students’ examinations. The development of plans, choice of lessons and the materials to be employed are increasingly expected to be common to all teachers in a given subject. This approach not only strangles creativity, it smothers the development of critical thinking in our students and assumes a one-size-fits-all mentality more appropriate to the assembly line than to the classroom. Teacher planning time has also now been so greatly eroded by a constant need to “prove up” our worth to the tyranny of Annual Professional Performance Reviews (through the submission of plans, materials and “artifacts” from our teaching) that there is little time for us to carefully critique student work, engage in informal intellectual discussions with our students and colleagues, or conduct research and seek personal improvement through independent study. We have become increasingly evaluation and not knowledge driven. Process has become our most important product, to twist a phrase from corporate America, which seems doubly appropriate to this case. For the last decade or so, I have had two signs hanging above the blackboard at the front of my classroom, they read, “Words Matter” and “Ideas Matter.” While I still believe these simple statements to be true, I don’t feel that those currently driving public education have any inkling of what they mean. 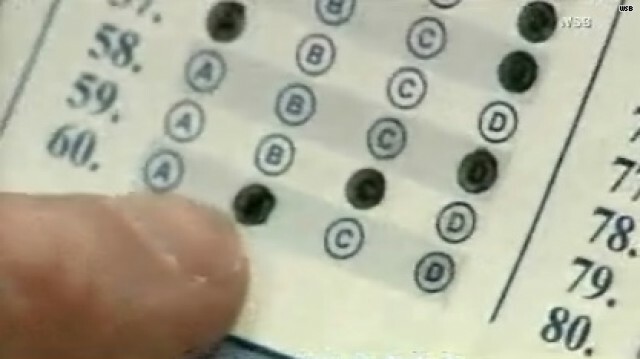 "No No...switch that to C as in ...cash"
Enter the Atlanta Cheating Scandal. I have heard from 4 different people in my personal circles about this over the past 4 days. Each had an opinion as to the cause of the scandal and what should be done. I bit my tongue. Do I sympathize with the teachers and officials who cheated? ABSOLUTELY NOT! I faced the same choice but it never even crossed my mind to cheat. It is sad many do think about it but I maintain the vast majority of good people in teaching do not. Then this morning on the last weekend of my Spring Break I catch the opinion column by Cal Thomas. Syndicated columnist Thomas has said tons of things to which I object since he makes most conservatives appear liberal. So objecting to his "informed" opinion is not unusual. This morning, he wrote about that scandal and I agree with most of what he said. He even mentioned Eugene Robinson....but qualified him as a "pro-public school columnist" which implies he himself is not. "The teachers’ unions and many Democratic politicians, who receive their campaign contributions, oppose school choice, which would improve not only public schools, but also the chances of poor and minority children to have a better life." Ooh...the evil unions again. I tire of this refrain. Georgia, like Virginia, is a right to work state and public sector employees cannot collective bargain, strike or do many other "union" type things. To affix all the ills of education on the union is frankly beneath anyone of moderate intellect. So I will excuse Thomas. Educators in Atlanta can join professional organizations and donate money but I doubt they spearhead the effort to subjugate poor and minority children. To use this to bolster the argument for "school choice" makes it appear as if a focus group switched your energies from "testing and accountability". A permanent fix school choice is not. I'm pretty sure a brief history lesson of the South, Atlanta in particular, might remind folks like Thomas of the value of public schools. Advocating their dismantling in favor of a private voucher driven system is short sighted and just a bad idea. Read more about why here. If you play this out and consider if every student were given a voucher to schools that could deny admission or remove students by a lower standard and you've compounded some issues you seek to resolve. "Could school choice be the answer? Indiana thinks so. Last week, the state’s Supreme Court upheld a voucher program that gives poor and middle-class families access to tax dollars to help them pay private school tuition. Parents should decide where their children go to school." OK. The secular argument against vouchers falls short in Indiana. But that ruling doesn't apply nationally yet. Worth adding that even though Indiana has among the most far reaching voucher law only about 9,000 children used the vouchers last year. That number will certainly grow and unlike elsewhere, there are fewer income limits, meaning more middle class families can take advantage. That seems to counter the main reason these laws are championed, to benefit poor students in under-performing schools. Vouchers themselves are not evil. But they have "issues. " Time will tell. Lastly this was slipped in" "It’s not the children who cannot achieve. It’s the system that fails them." This is often true. But let's not reduce an incredibly complex and lengthy process into "school choice." Vouchers might do some good but would also impact many quality schools in unforeseen ways. An expert would pick up on this. Many of these same experts also voted now indicted Beverly Hall as National Superintendent of the Year.